Mud: for some riders it's a short, seasonal nuisance, which they contend with by either hanging up their chamois for a few months or by gritting their teeth and muscling through the slop for a handful of rides. And then there are other riders…people, such as myself, who live in areas that never properly dry out. We ride in conditions that merely vary between wet and sloppy wet and this fact drives most of us to pony up the cash for mud tires at some point or other. But here's the thing with most mud tires: most of the skinny, spikey tires that give you excellent purchase in the mud are less than awesome when its time to ride a stretch of wet rocks or roots or, well, anything not resembling a mud bog. I like large volume tires. I like to ride them at low pressures. It's what keeps me upright on those steep, rocky sections of trail. It's a matter of traction. Unfortunately, most of the mud tires that I've ridden in the past are of the skinny variety and require relatively high pressures to fend off pinch flats or (if they are tubeless), just don't offer the kind of footprint I like in a tire. This tire—the new Michelin Wild Mud 2.25—is an exception to the rule. Michelin has been revamping their tire line of late and the Wild Mud is a good example of that they've been up to. The tire features twisted tread blocks, which according to Michelin, deform when they are in contact with the ground and are subjected to braking forces. In the process of deforming and then returning to their original shape, they are said to "eject" mud from your tread. So they shed mud. But, as the game show hosts are prone to saying, there's more. 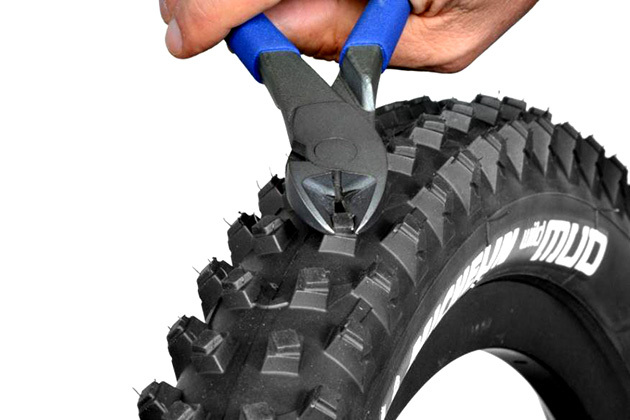 The Michelin Wild Mud comes in a new, super soft rubber compound (MAGI-X) that should work wonders on wet roots and is supported by a burly, reinforced casing (there's an additional ply running from one bead to the other) that should help fend off gashes in rocky conditions. Enduro is the great buzzword of the past two years (I just finished a bowl of Enduro Cheerios and am about to put on my Enduro-specific jock strap!) so it's probably not surprising to hear that Michelin is calling this an Enduro-inspired chunk of rubber. Having scoffed at that sentiment, it's worth noting that Fabien Barel (no slouch at enduro racing, with three major wins in 2013) has helped design some of these new tires. An enduro mud tire? If that means a tire that sheds mud and makes steep, fast, rocky descents that much more awesome….well, sign me up. Those knobs are too tall and squirmy for you? Trimming the Michelin Mud is dead simple and will reduce the rolling resistance for drier conditions. Oh, and then there's this: let's say your trails don't feature particularly deep mud section and you find those tall center knobs too squirmy for your conditions and tastes. Well, if that's the case, you can cut the center knobs down a bit to reduce rolling resistance and cut down on the squirm. Sure you can do that with any tire, but Michelin has made it easier by, essentially, putting guide marks on the tread that make trimming those knobs a good deal easier and quicker. It's basically a matter of shearing off the upper twisty section of the knobs. If you ride in mixed terrain or the season progresses and things start to dry up, you'll probably want to take advantage of that and custom tune your tire a bit. Naturally, you'd be giving up some of the mud shedding potential, but if conditions dry up and that's what's prompting you to tinker with the tread, you probably don't mind that fact. 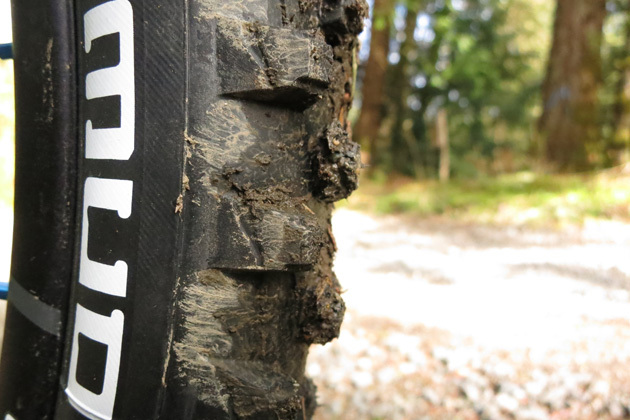 Finally, the Michelin Wild Mud is tubeless ready and weighed in at 1,002 grams per tire. The advertised weight on the 27.5 version is 990 grams, but there's always some variance from tire to tire. While I opted for 27.5-inch meats, Michelin also offers the tire in 29er trim. Nice. The tire is a healthy 2.25-inches, which is to say, it’s a bit bigger than that number suggests. For a mud tire, it’s big. 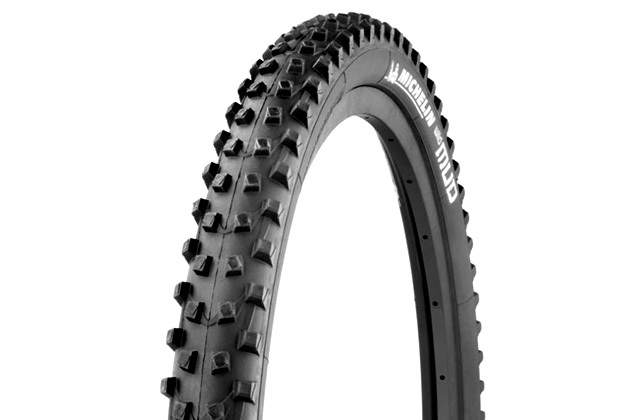 For an enduro tire, it’s mid-sized. I've only recently mounted the Wild Mud to my rig so I'll refrain from saying anything definitive at the point. I can say after a few rides on `em, that you'll definitely want to trim some of those crown knobs if you rides include decent stretches of hard pack or is a mix of mud and dry. If you're neck of the woods is still saturated, you'll find the uncut tread boosting traction like crazy. The uber-soft compound is also immediately noticeable on wet roots, boosting traction in a very big way. How will that tacky rubber hold up to significant mileage? That's the $100 question…which is a particularly pressing matter when you consider that's essentially what you'll pay per tire here. Ouch. When you fork over that much coin for some rubber, it better hold up for a decent chunk of your season. Subscribe to BIKE’s Newsletter to receive stories like this straight to your inbox. Neat stuff from Lezyne, Hydro Flask, OneUp, Rocky Mounts, Marzocchi and ... Fat Chance? New-school XC or old-school marathon? What took them so long?